250 gr of chicken or partridge. 500 g of gazpacho cake. 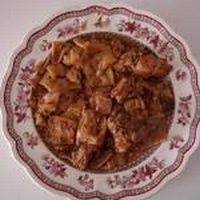 – Chop the chicken and rabbit into small pieces that are boiled in a pot with water and a little salt until the meat is almost done, at which time we set aside. Meanwhile in a gazpachera (large frying pan with a long handle), heat the olive oil and fry the onion, finely chopped, the tomatoes, also chopped, and the chopped mushrooms. – Then add the meat that is also frying. We can, if we like it better, debone it at this time. On the other hand, we will have cleaned and cooked the snails “deceiving them”, that is, on very slow and weak fire so that they remain outside the carapace. Half of the cake is crumbled into small pieces and added to the gazpachera, adding enough broth from the cooking of the meat to cover everything. Season to taste with salt and pepper and add pebrella and thyme, cooking everything over medium heat and stirring to avoid sticking. – Once cooked, pieces of raw cake are placed in the bottom of each diner’s plate, placing the gazpacho ration on top of the cake. Once the gazpacho is finished, the cake that served as our base can be eaten with honey, resulting in an exquisite contrast.